Director Rachid Bouchareb’s story of a family of Algerian immigrants to France and their lives from 1945 to 1962 has been likened to “The Godfather” or “Once Upon A Time in America”. Like the excellent “La Haine” which touched on the same themes, the movie provoked protests and high security when it played the Cannes film festival and right-wing French politicians labelled it historically revisionist and "anti-French". Bouchareb’s previous Oscar-nominated 2006 movie “Days of Glory” shamed the French government into supporting Algerian veterans who fought for the French state against the Nazis in World War Two. “Outside The Law” reunites many of the previous film’s cast. Brutal, real and enjoyable, “Days of Glory” had me slavering at the chops for more. After all, a well-made action movie with a social message is the best of both worlds – the equivalent of Saturday night in the pub and early Sunday morning mass rolled into one. Sadly, I was disappointed. “Outside The Law” limps prosaically through over two hours chronicling the brothers varied involvements in the cause of the arm of the FLN, a terrorist group whose premise was to campaign for Algerian independence, from within French borders. One leads it, asserting control first over the organisation’s French chapter and then over rival groups, the other, a veteran of the doomed Indochinese war, is the violent facilitator of the FLNs’ ends, and the last distances himself from the group until forced to participate. The irony of this premise is little explored, except in the film’s intellectual denouement when arch-nemesis police inspector Colonel Faivre (Bernard Blancan) is forced under duress to meet with our boys in a posh Parisian in private club. Abdelkader’s comparison, and the ironic synchronicity, of his own political and armed struggle for Algerian freedom with the Colonel’s previous decoration for his role in the French Resistance to Vichy regime is well-made. 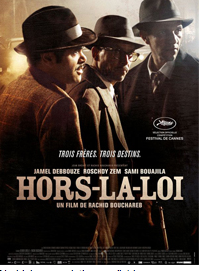 Bouchareb has used the family tale as metaphor for French immigrant experience; represented by brothers Abdelkader (Sami Bouajila), educated and politicised; Roschdy Zem as Messaoud, the brutal bag-man and assassin, and Jamel Debbouze (of “Amelie”) as Saïd who is amoral, entrepreneurial and secular. Stoic and grim, the boys’ mother (Chafia Boudraa) is the patriotic conscience and maintains the family’s religious and traditional practices; she is also the most vibrant of the female cast members, although that’s not saying much. Messaoud’s wife is dutiful and introverted and Sabrina Seyvecou as Hélène, a white French sympathiser and financier to the FLN cause is anaemic and obsessed with unfulfilled desire for Abdelkader. His rejection of her advances in favour of total devotion to the cause is clumsily portrayed and represents a token attempt at character development. Better handled is the conflict played out between the brothers. Saïd’s dream of creating the first French boxing champ of Algerian origin, representing ideas of assimilation, is opposed by the very real threats he faces from his ideologically torn brothers who see his fighter as a courtesan of the despised French state. Given that we already know how violent the group’s measures can be, how far will they go to stop the fight, we wonder? Action scenes such as the opening recreation of the infamous Sétif massacre in 1945 were well made (Bouchareb admits he was trying to create "a sort of western") but the plot develops falteringly and there’s a sense that in trying to popularise the movie beyond its natural audience, an action scene has been added every so often to cattle prod us awake again between the characters’ soap opera-like vacillations. Telling the story of a 20th century conflict from the underdog (and ultimately winning) perspective is undoubtedly a rich, unmined cinematic vein; Vietnamese Bảo Ninh’s novel “The Sorrow of War” would be an interesting antidote to the abundance of Hollywood movies on the same topic. Arguably “Outside The Law” is another take, from a different angle, on the much better “Battle of Algiers”. If Bouchareb wished to again provoke social change and political action he has succeeded. There is even some similarity in his film in this respect to Visconti’s “Rocco and his brothers”. If he wished to entertain, he has fallen short of the mark, but not failed entirely. Add to your Lovefilm rental queue but don’t pay good money to watch at the cinema. HORS LA LOI / OUTSIDE THE LAW played Cannes, Toronto and London 2010 and opened in France, Switzerland and Belgium in September. It opened in the US in November.